The Alto-Adige borders on Austria where mountains dominate the landscape of this Tyrolean region, leaving space for vineyards only on the banks of the rivers Adige and Isarco, around lakes such as Caldaro and on slopes of porphyritic soils of volcanic origin at the foot of the mountains. 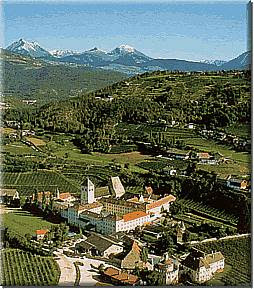 Located in Alto Adige, Italy’s most northern part touching Austria to the North, and surrounded by Veneto from East to South and Lombardy to the West, Abbazia di Novacella has many faces: it is a winery, but also a Monastery or Abbey, a farm, and a scenic stop for many tourists. Above Bressano, more precisely in Varna, a small Abbey-village of the beautiful Isarco Valley overlooked and protected by the foothills of the alps, Abbazia di Novacella is specializing in cool-climate white wines, many of which are made from German and Austrian grapes like Riesling, Gewurztraminer, Sylvaner and Kerner. seasonal workers. Despite producing wines and growing apples, they also grow all sorts of fruit and vegetables. Abbazia di Novacella's most planted grape variety is the Sylvaner. They also produce a great Kerner, both wines are highly preferred and suggested as the perfect examples of what the Abbey can do by Urban von Klebelsberg, the Administrator of Abbazia di Novacella. Other white varieties grown include Müller Thurgau, Gewürztraminer, Pinot Grigio, Sauvignon, and Veltliner (also known as Grüner Veltliner). All of these varietal whites are labeled under the DOC appellation, "Alto Adige Valle Isarco". Abbazia di Novacella also produces a blended white wine made of Sylvaner, Pinot Grigio, and a touch of Chardonnay, called Weiss. The steep hill slopes soil consists mainly of granitic schist under only a few inches of dirt, created by ancient glaciers. With ever-changing microclimates and rough diurnal temperatures, in addition to little space for their roots and small amount of dirt to hang on to for nutrition, the vines do not last as long as in more temperate climates, 35-40 years at the max. The high altitude vineyards’ rugged soil and extreme climate changes produce low quantity of fresh, aromatic, vivid yet rich and mineral, inviting, summery white wines. Abbazia di Novacella produces many whites divided in two categories of wines: the standard category and the premium category, labeled under the name of Praepositus, usually more expensive than the former. Compared to the standard category which only undergoes his vinification in stainless steel tanks, the Praepositus category can sometimes be aged afte fermentation in old, large oak fut (or foudres or bottes) to add more dimension, character and fullness to the wines. Difficult grape to grow, Sylvaner is often called "the white Pinot Noir" for its weather affected moody attitude. The German examples of Sylvaner are usually quite simple and often lack in complexity. 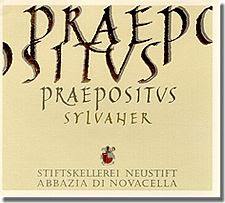 The 2007 Abbazia di Novacella Sylvaner "Praepositus" is an excellent, fresh, mineral and crisp white wine. Dry, yet viscous, well rounded and packed with zesty, rich yet vivid white fruits and mineral flavors, this beautifully crafted Sylvaner will surely enhances all of your summery salads and nicely complement any fish and white meat dishes. You should also try the 2007 Abbazia di Novacella Kerner which is also a great summer white in the same tone of aromas and flavors, yet a touch brighter and juicier than its sibling Sylvaner (in my opinion). The territory of Franciacorta is a section of the Province of Brescia in the Italian Region of Lombardy. Lombardy is the central-northern region of Italy, touching Austria to the North, and surrounded by Trentino-Alto Adige & Veneto to the East, Emilia Romagna to the South and Piedmont to the West. Shaped during the ice age and, especially after, during the melt down and the slow erosion process of the glacial era (and even now with global warming and rise of temperature), Lombardy’s geography exposes a landscape of small mountains and gentle rolling hills. The soil flourishes of glacial moraines, which consist of unconsolidated gravel and sand over limestone, allowing great drainage, ideal for the cultivation of grapes and winemaking. The weather is mild and constant due to its location south of the foothills of the Alps, with optimum sun exposition for the vineyards and the tempering presence of large lakes: Lago di Guarda & Lago d’Idro. Born in 1953, Winemaker Roberto Gatti, son of a winemaker from a rural family in Cazzago San Martino, moved a few years later with his family in Erbusco, true heart of the Franciacorta wine area. While young, he worked with his father in a popular winery producing Franciacorta wines. After the departure of his father, for almost 20 years, he continued to work as a cellar and vineyards manager for the same winery. During those years, he increased his skills and became seriously acquainted with the traditional Franciacorta viticulture and its peculiarities. Meanwhile, he also learnt and experienced the latest wine-growing techniques. In 1975, he married Andreina and together in 1990 they bought 10.000 acres of land in the districts on Adro and Erbusco. 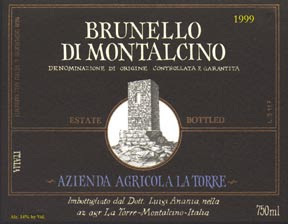 Also in 1990, he was offered the chance to run a small winery, previously abandoned by its old owners, and started to make his own wine, initially sold in bulk. With the harvest of 1991, strong of his 20-years experience and confident to succeed, Roberto introduced two bottled wines, a Terre Di Franciacorta red, and a white. The Ferghettina winery was born, with only one aim: to always produce high quality Franciacorta wines! Currently, the company manages 100 hectares (247.000 acres) of vineyard, planted in the 6 districts of the Franciacorta area to get the most from the different type of soils, in order to get unquestionable advantage in terms of diversity, complexity and quality. Roberto is now assisted by his daughter Laura who has a degree in Winemaking, his son Matteo also studying in the same field, his wife and 15 employees. In his newly built, state of the art winery, Roberto produces about 300,000 bottles including 4 types of Franciacorta DOCG Brut, Satén, Extra Brut and Rosé (sparkling wines) and 4 types of DOC (still wines) including two Terre Di Franciacorta white, one red and an I.G.T. Merlot. Even to this day, his first produced Franciacorta Brut remains the top of the line wine of the winery. The positive reputation of Mr. Gatti and his nearly 40 years dedicated to this appellation, tremendously help this region to grew at fast pace and to gain vivid recognition from the press and the amateurs. Made from 80% Pinot Noir and 20% Chardonnay, the 2003 Ferghettina Franciacorta Rosè Brut D.O.C.G presents a very intriguing yet attractive pale onionskin pink color with many reflects, and fine minuscule bubbles. Left in contact with the yeast for 36 months in bottle, it exposes pleasant aromas of fresh raspberry and red wild berry mixed with rose petal, mineral, and light yeasty, bready notes. The palate is elegant, harmonious, fresh and inviting. Very integrated, focus and persistent combined with a pleasant softness, this wine reflects delicacy, freshness and elegance with a bright and versatile yet solid structure that will allow you to serve it with every course of the meal, from the aperitif to the desert. Chateau Paveil de Luze is a Cru Bourgeois Superieur du Médoc, which belongs to the Barons de Luze since 1862. This small, historic family estate, located in the village Soussans in the Médoc (one of the commune of the Margaux appellation), is one of the oldest properties in the area, and dates back to the early 17th century. With vineyards planted of three-quarters Cabernet Sauvignon grape and one quarter Merlot, this is a typically fragrant, feminine Margaux. The grapes are picked by hand, followed by a traditional vinification process. Fermentation for 3 to 4 weeks depending on the year. Ageing and conditioning in oak barrels for 12 to 14 months depending on the vintage. 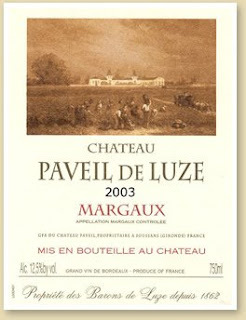 Made of 65% Cabernet Sauvignon, 30% Merlot and 5% Cabernet Franc, the 2006 Chateau Paveil de Luze is a charming and classic Margaux displaying juicy fruit characters with a good underlying acidity. The palate is fine and balanced with fairly ripe, slightly spicy yet gentle red and dark fruit flavors with firm yet integrated tannins. It displays good potential for further ageing in bottle. A very enjoyable and approachable Margaux for less than $35 on the shelves, which is a rare thing. The DeForville family emigrated to Piedmont from Belgium in 1848 and established themselves in the village of Barbaresco in 1860. Here, the family started to grow Nebbiolo grapes. In 1907 Paolo Anfosso married into the DeForville family and took over the reins of the family business. For five generations, the Anfosso family has lived in the nearby town of Castagnole Lanze and, to this day, vineyards are maintained in Castagnole. In the early part of the 20th century, the DeForvilles sold their wine in bulk directly to restaurants and to retailers who then bottled the wine. In 1940 the Anfossos bottled their first wine and now virtually their entire production is bottled at the estate. Valter and Paolo Anfosso, sons of Bruno, now manage the estate. The 10 hectare Domaine is divided between holdings in the villages of Barbaresco [3.5 hectare] and Castagnole Lanze [6.5 hectare]. Within Barbaresco, Nebbiolo is planted in the "cru" vineyards of Rabaja, Loreto and Pozzo. Dolcetto is also planted in the Loreto site and Barbera is cultivated within the "cru" of "Ca'Grossa". 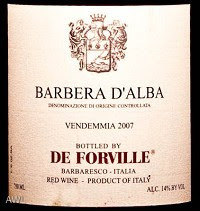 2007 De Forville Barbera d'Alba is a lovely, earthy, juicy example of what a good traditional Barbera can taste like. Beautiful ruby color. The nose offers earthy, slightly smoky bright fruit tones. The palate is really juicy in the attack, exposing red cherry and unripe strawberry notes. 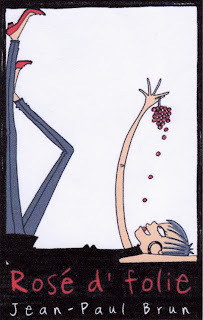 The mid-palate expands gently toward the earthy, touch dry, finish. Hints of integrated oak and vivid acidity bring structure and freshness to this constantly good, quaffable, traditional Barbera. Crisp and easy drinking. Love it, as always. Julienas where he possesses about 8 hectares, plus a small amount of Chenas, Moulin a Vent and Beaujolais Villages. After a careful selection from his best parcels of vines, he separates the wine destined to be the "Grande Reserve" from the cuvee designated "Cuvee Speciale". These special wines are usually aged longer in barrel, the Grande Reserve remains in small oak barrels for two years prior to being bottled without filtration. 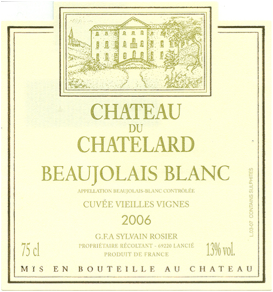 His 2007 Beaujolais Villages is amazingly attractive, bright, balanced, harmonious and delicate. Its juicy, red fruit character intermingled nicely with elegant acidity and pure mineral texture. Like most of his wines, this Beaujolais Villages has high quality profile and taste. Love it.